PHOTO SUBMITTED An electric fish barrier similar to the proposed electric barrier for Dickinson County has been in place near Windom, Minn. for 20 years. It has proven to be quite effective in preventing new species of fish into the nearby Heron. The Asian Silver Carp is threatening to enter the Iowa Great Lakes. Officials throughout Dickinson County have focused on efforts to stop zebra mussels from entering the Iowa Great Lakes. The Dickinson County Board of Supervisors on Jan. 10 approved a motion to contribute over $3,000 to the study for installing an electric fish barrier to prevent the arrival of Asian carp in the Iowa Great Lakes. The carp were recently found in Lost Island Lake, just 15 miles from the Great Lakes. Asian carp can grow up to 60 pounds and three feet long and are known for jumping high out of the water. Once the fish have invaded a well-trafficked lake, they can become great distractions to boaters, skiers and Jet Ski operators. Vibrations from the motors cause the fish to jump out of the water, potentially right in front of boats and skiers. 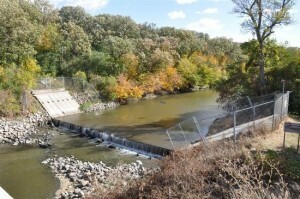 Extreme floods along the Missouri River in 2011 allowed carp to swim around the Linn Grove Dam and work their way toward the Dickinson County chain of lakes. The Asian Carp’s cousin, bighead Asian carp, were actually found in East Lake Okoboji in August 2011. As is the case with many invasive species, there is no proven way to remove the aquatic intruder once the lake has been infected. The electric barrier is proposed on land already owned by the local DNR near the Lower Gar outlet. The Iowa Great Lakes Water Safety Council (WSC) considers this to be the best location. An electric barrier further downstream would potentially trap other fish and cause a pungent die-off between the weir and the barrier. One of the most common inquiries of an electric barrier is the potential danger to animals and humans — the charge isn’t even strong enough to kill off the fish. Petersen also said that humans or other animals such as deer or dogs are not in danger of being killed. “We don’t believe the voltage used is enough to kill animals or people,” he said. “But to be safe, it is standard operating procedure to place signs (warning) of electrical danger and (to) fence (off) the area. Studies have shown that an electric fish barrier is an effective way to prevent a species from entering a lake. During a two-year study done by a research team from South Dakota State University in the early 1990s, 1,600 common carp and south buffalo fish were radio tagged and released downstream from an electric barrier. When they later caught over 3,000 fish, not a single one of the tagged fish were found. In addition to preventing the intrusion of the invasive species, the electric barrier has another benefit — it prevents other fish from leaving the lakes. Local officials estimate the cost of the project at $700,000. State Reps. John Wittneben of Estherville and Jeff Smith of Spirit Lake are working with state Sen. David Johnson of Ocheyedan to secure state funding for the project. The local Water Safety Council thinks at least $200,000 will need to be raised locally to support of the electric barrier project. The funds will come from the various lake protective associations, fishing businesses, local governments and property owners. The DNR will need funds identified by March in order to move ahead with the project before the start of the 2012 vacation season. For more information on Asian Carp please go to this link.